Dental bridges are a fairly common tooth restoration option that uses existing teeth to serve its purpose. A typical bridge is comprised of two crowns with a false tooth between them. The crowns slide over the teeth while the false tooth slides comfortably into the gap of the missing tooth. 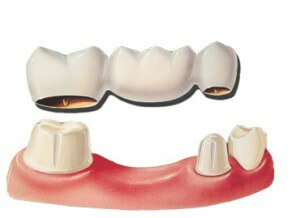 In cases where there are existing teeth on only one side of the gap, a different type of custom bridge can be created. Dental bridges are usually designed using a computer-generated zirconia/porcelain material to create the perfect fit and a natural appearance. Other materials that may be used include gold, metal, and alloys. Each one of these materials is strong and durable in order to ensure maximum longevity. First, we create abutments out of your existing teeth where the dental bridge will be attached. You existing teeth will be reshaped to provide an attachment for the bridge. Then, a mold is taken of the area and sent to a dental lab. While you wait for the permanent dental bridge to be sent back to our office, you will be provided with a temporary bridge. When your permanent dental bridge(s) arrives at our downtown New York office it will be placed on the abutments and glued in place with adhesive to ensure it remains permanently attached. After your permanent bridge is installed, you will be able to eat whatever you want without any discomfort. Pay special attention to your oral hygiene because a bridge has multiple crowns connected together. The team at Tribeca Advanced Dentistry will provide you with detailed instructions so you can easily maintain your bridges and keep them in good shape for as long as possible.